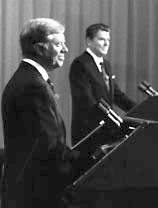 "There you go again" was a phrase spoken during the 1980 United States presidential election debate. It was said by Republican presidential candidate Governor Ronald Reagan to his Democratic opponent, then-current President Jimmy Carter. Reagan would use the line in a few debates over the years, always in a way intended to disarm his opponent. ↑ "There You Go Again". The Washington Post. 2008-01-24. Retrieved 2008-11-05. ↑ 2.0 2.1 Raasch, Chuck (2004-06-05). "Former President Ronald Reagan dies at 93". USA Today. Retrieved 2008-11-05.